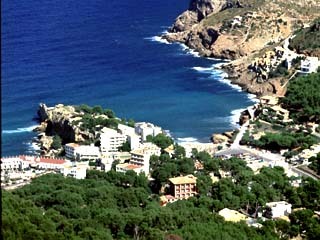 The Hotel Cala Sant Vicenc is family-run and situated in the centre of Cala Sant Vicenç, just 200 metres from the sea. The red stucco plastered façade, sandstone arches and wrought iron balustrades contrast against the green of the gardens and neighbouring pine trees. A large exterior Swimming Pool is heated during the winter months dominates the exterior of the Hotel. The interior offers a welcoming atmosphere of natural stone floors, beautiful Persian rugs together with antique furniture and small details hiding in each hook and cranny, all thanks to the talented Joana Suau. Abundant seasonal fresh flowers contrast against walls displaying works of art by local artists, which clients can admire and acquire if they wish. The Hotel was built in the 1930s and named Hotel Cala San Vicente. It became the first Hotel in Cala Sant Vicenç and a pioneer for tourism on the island. During the 1960s it was enlarged and was given an official three star rating with 48 Rooms. In 1974, Llorenç Suau acquired the Hotel and from this time onwards, even with the simple installations in accordance with a three star establishment, the Hotel began to be recognised for the quality of services offered and its personal touches. The Hotel was awarded, “Best Small Hotel of the year” by Hogg Robinson Travel in 1989. In 1990, an unused Lounge was converted into an Italian Restaurant which, within a very few months, became one of the most popular in the area. Animated by this success, the old Dining Room of the Hotel, where a menu for clients on half-board only was served, was refurbished and converted into the Restaurant Cavall Bernat, opening to the public in April 1992. From then on, the intention has been to make this Restaurant the gastronomic reference of the area, offering creative dishes based on local produce. It was between October 15th and April 1st 1996 when the Hotel suffered a definitive transformation converting into what it is today. Apart from the two Restaurants the whole building was gutted and rebuilt. All interior and exterior installations were renewed. The conversion from 48 to 38 Rooms allowed for the Rooms to be larger and more comfortable and for an indistinctive building to be given a beautiful Mediterranean façade. During the winter of 1999 and 2000 both Restaurants have undergone a new refurbishment and are now showing a modern and minimalist design. In the Cavall Bernat guests can additionally admire the art of one of Mallorca’s most famous artists, Joan Bennasar. In November 1997 the Balearic Tourism Department awarded the Hotel with the Silver Plaque in recognition of an example of pioneering initiative towards quality tourism on Majorca. On the 1st of December 1997, the Hotel Cala Sant Vicenç became part of the prestigious Relais & Chateaux organisation during the annual congress held in Bordeaux. In 1998 the British Tour Operator Thomson, honoured the Hotel Cala Sant Vicenç with their “Gold Medal Award”. Magic of Spain named the Hotel “Best Resort Hotel” in 1999. The year 2000 brought the award of “T of Tecnoturistica” for Best Tourism Firm of the Balearic Islands, from the local government, through the tourist board which was given by the Commerce of Industry. The Cala Sant Vicenç is to be found at the northern end of Mallorca, where the Tramontana mountain range begins. Once a fishing village, it has developed into a summer residential area, with four bays, three of which are sand, with crystalline waters. From the beaches one may contemplate the majestic spectacle offered by the Cavall Bernat, which is the most painted cliff of the island due to its extraordinary beauty and the chromatic shading revealed with each sunset. Restaurant Cavall Bernat: Dominique L´Honoré, head-chef of the Restaurant Cavall Bernat was born in 1963 in France. His training began in Luxembourg at the La Lorraine Restaurant, specialising in fish dishes. Moving on to take the position of second chef in the La Bergerie Restaurant - 2 Michelin stars. Two years later he moved to the Lea Linster Restaurant - 1 Michelin star and winners of the Bocuse d’Or prize, as second chef where he spent two years before moving to the restaurant Le Maxilien on the Cote d’Azur where he worked as head-chef for three years. Arriving on Mallorca in 1997. His speciality is Mediterranean cuisine, predominately fish dishes using the catch that comes in every morning from the Cala Sant Vicenç Bay. Dominique’s cooking is simple, taking advantage of the local produce and bringing all its flavours to a maximum. The wine list offers a carefully selected choice of Majorcan wines together with the best from Spanish and international cellars. For more informal occasions, the Hotel offers a lighter menu that is served at the Bar by the Swimming Pool. The Hotel also have an Italian Restaurant.